Parent story: Konjiki no Gash Bell!! My sister and I are huge Zatch Bell fans, and we were extremely happy to find out that there was a movie on it. We both happily watched the movie with high expectations and glorifying hope that this movie will be one of the best movies we will ever watch. However, we were both disappointed on its overall outcome. "Zatch Bell Movie: Unlisted Demon 101" is an overall cliche movie that I feel will most likely leave its fans a feeling of disappointment. Indeed I will admit that I have watched several other anime movies and thus could easily compare and contrast which one has left a better impact on its viewers, but I believe that even a person who has no experience of watching several anime movies, such as my sister, could easily have known or thought that the creators could have done a way better job in the movie's creation. There is nothing remarkable about this movie's plot yet nothing bad about it either. I just found it uninteresting is all. 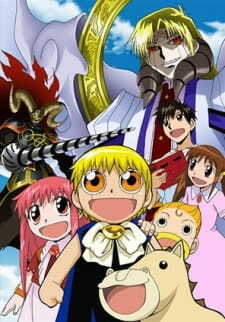 The movie starts off with a normal girl named Kotoha who has no knowledge whatsoever on the momodo/demon world, but is somehow whisked away by it by the main antagonist who is filled with hatred, jealousy, and all those other negative emotions and the strange golden haired boy we all know as Zatch or Gash. One problem I found in this movie is that the creators did not put in too much effort when trying to make the movie a masterpiece that will make the people watching it go “OMFG THIS SO FRIGGIN AWESOME, I’VE NEVER SEEN SO MUCH EPICNESS IN MY WHOLE ENTIRE LIFE!!!! !” Instead it probably made them go “I guess it was okay, but they could have done way better job.” The movie also failed miserably on outlining the overall message or life lesson as you may call it. I felt as if the creators only had the idea of making the whole fighting scene cool by adding some ignoramus flashy creature to finish the whole movie off with a BANG; however a movie does not need some weird looking powerful creature to make it interesting, but maybe a simple message to tell each viewer that we do not need some out of this world power to defeat the problems that may come our way, but the help of our friends to guide us to the right directions in which life may take each one of us. There was nothing wrong with the art or music of the whole entire movie. Nope, nothing wrong with it at all. Sure the creators could’ve done a better job at the movie’s art, but the art is the way it was in the TV version, and we all know that Zatch Bell’s art is not the greatest. Same with the music, there was absolutely nothing special with it, it was just plain average. If you were expecting a bunch of the Zatch Bell seiyuus to walk on the red carpet gallantly to get the “Number 1 Voice Actors Award” than I’m sorry to say this, but these voice actors did none of that! These voice actors just did what their supposed to do, their job!!! Throughout the rest of the movie it mainly concentrates on Zatch and Kyo which I count it to be as one of the movie's mistakes. Of course, it makes perfect sense that the two main characters should have most screening time, but I believe they shouldn’t take about 80% of the screening time! We don't even get to see Kanchome, Ponygon,Tia, and their partners that much, we only get to see them about 4% of the time! The villain, I believe, needed much more screen time. The movie didn’t fully express the feelings of anger the main antagonist was supposed to feel, as a result, we have a villain who is just there to add some difficulty for Zatch and Kyo. You may think that’s what all villains are for, but I like to think that a villain needs more than just some evil attitude to be a villain, I do not know what other qualities villains should have, but perhaps it has something to do with the way it is expressed. Lastly, I didn’t see an appropriate amount of any character development for any of these characters, not even Zatch or Kyo who are the main characters of this whole dang movie showed some signs of noticeable growth till the last few ending scenes. Oh how do I express all the emotions I felt for this movie? Oh yes, uninteresting, apathetic, boring, cliché, and all those other adjectives used to describe the feelings of boredom more fancifully. During the whole movie I was bored, absolutely bored! I thought this movie might make my spirits bright where I will sing a song of praise to thank the heavens for taking away my boredom, but instead it just made me even more bored. I even yawned a couple of times, and nearly fell asleep just to express my overall boredom to this movie. Sadly this movie was a waste of my time, and I kind of regret wasting about 1 hour and 25 minutes of my life. I greatly apologize to all those who thought this movie was an absolute masterpiece, however I am allowed to express my feelings and therefore will in this review which took me over an hour to write.